Throughout this video from 2009, Annie can be seen playing a Epiphone EJ-200CE Acoustic-Electric Guitar. 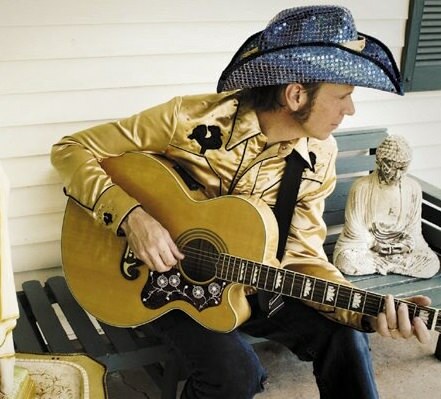 Tom can be seen playing the classic Epiphone model during a pre-blossoms performance. Country artist, Laura Bell Bundy, was featured on the cover of the August issue of Nashville Lifestyle. 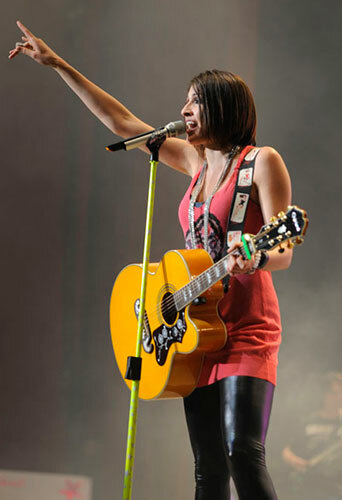 The magazine also gave away an Epiphone EJ-200CE Acoustic/Electric guitar signed by Laura. 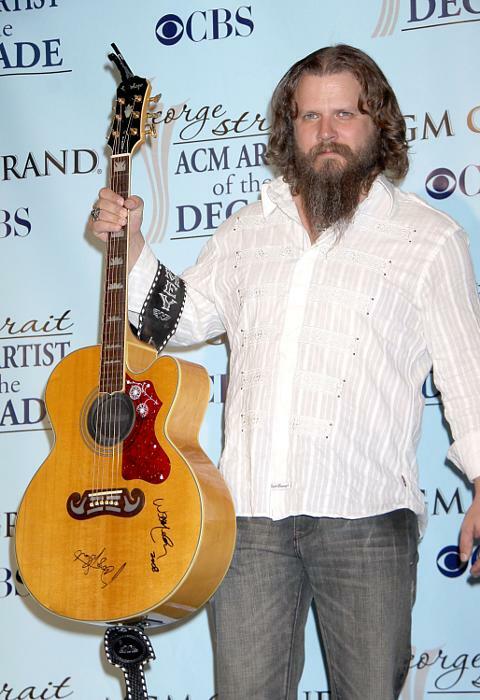 Fitzgerald can be seen playing an Epiphone EJ-200 in the cut away version since early 2017. Mexican-American sister duo Ha*Ash gave an astonishing performance to a capacity crowd at Mexico City's prestigious Auditorio Nacional. To the delight of their fans, Hannah and Ashley performed a collection of their biggest hits with their beloved Epiphone Performer SE and Epiphone EJ-200CE. 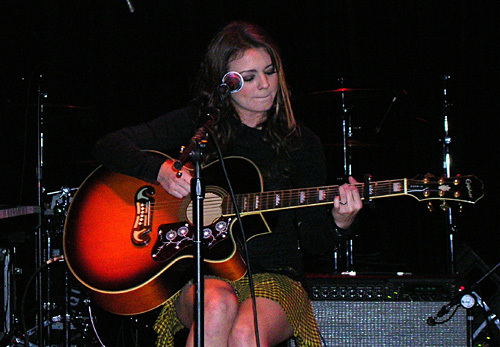 On December 6, 2004, she performed at the Knitting Factory in Los Angeles with her Epiphone EJ-200CE. Check out the pictures below. Epiphone's version of the Gibson classic J-200, known as the "King of the Flat Tops", a guitar that has graced stages across the world in the hands of musical legends from Elvis to Emmylou. This modernized EJ-200SCE, features a jumbo maple body with a select spruce top, a stylish mustache bridge, gold hardware, crown inlays on the fingerboard, and a huge sound easily amplified by the an eSonic2 preamp with built-in tuner and NanoFlex/NanoMag pickups. Case sold separately. The EJ-200SCE's construction features a solid spruce top with select maple, back and sides and a striking cutaway that provides you better fret access than its predecessor. This 25.5" scale beauty also comes with Epiphone's SlimTaper select maple neck which helps give you a smoother ride up and down the rosewood fingerboard. The rosewood fingerboard has vintage style pearloid crown inlays and a 1.68" nut along with our iconic Sloped Dovewing Epiphone headstock with premium die-cast gold 14:1 tuners. A fresh spin on classic toneThe tone from the EJ-200SCE's select maple top is enhanced by the classic rosewood "mustache" bridge and synthetic bone saddle. A tortoise-style pickguard with a unique dandelion art pattern helps round-out the EJ-200SCE's iconic look. Thanks to it's combination of tonewoods and construction, the EJ-200SCE provides you with a solid, yet balanced tone which lets rhythm guitarists and singer-songwriters feel like they're being backed up by a band even when they're playing a set pared down. The rich and complex tones the EJ-200SCE will truly inspire musicians everywhere over and over again. Taking the J-200 to whole new levels sonically, the EJ200CE features the Epiphone eSonic2 preamp system which features a built-in, easy-to-use tuner. And when you're playing, you don't have to worry about any accidental popping as the eSonic2 automatically mutes your output. When you push in the tuner button and unplug your guitar, it also keeps it "pop" free. The EJ-200SCE also provides you with tone-shaping options - NanoFlex Tone, NanoMag Tone, Stereo Blend - as well as Master Volume, and a Low Battery indicator and a Phase switch to help eliminate unwanted feedback. The eSonic2 is powered by two 2032 lithium watch batteries which are not only lightweight, but also last significantly longer life than more traditional, heavier 9V batteries. The EJ-200SCE features a compensated saddle with Shadow Germany's proprietary NanoFlex, low-impedance pickup. The NanoFlex's unique flexible sensing material has integrated active electronics that picks up string vibration as well as top and body vibrations for a truly acoustic tone without the harshness usually associated with piezos. As a compliment, there is a NanoMag pickup mounted at the harmonic-rich end of the fingerboard. It features three Samarian-Cobalt magnets and an integrated active circuit to capture all the highs and lows, including a wide range of harmonics. The preamp allows you to chose 1/4" mono output blending both pickups or 1/4" stereo output splitting the two pickups, giving you incredible flexibility and opportunities to create the perfect acoustic tone live. Check the drop-down menu to the right to select Black, Natural or Vintage Sunburst finish. Great Jumbo guitar for a great price. This guitars delivers greatly some truly bright and round sounds. I love the built in tuner. It has a shadow Nano Mag. It has a phase switch to prevent unwanted feedback. it has 2 inputs. one for the nano mag an the other one for the other pickup, I can't remember it's name. Haven't had any problems with this guitar at all. I'm in love with it's sound and so is everyone who has used my guitar. Every strum sounds like Noel Gallagher is playing, not me! Perhaps I'm not too in the know with the workings of acoustics, but I've found the gorgeous tone (particularly from finger picking) is just a lot deeper and richer than in smaller guitars I've played, perhaps the extra resonating space? If so, it's worth the meaty size and weight. The guitar is adorned with plenty of small details that add to how beautiful it is, with the gold coloured tuning pegs and marble-like inlays nicely complimenting the black body of my J200CE. £300 well spent. This is my first ever purchase of a guitar, and I have to say I chose well. Love the deep tonal sounds of it. It is the king of the flat tops, and it lives up to that name by its resonating deep sounds. I love it... and love playing it. Probably the best value for money acoustic you could get. Id highly recommend it! Essa beleza de instrumento não fica só na aparência, ele tem um puta som, dois captadores posicionados em diferentes pontos do corpo e os dois com uma qualidade absurda. Deep and rich tone, this guitar sounds really nice and clean. Its pretty big, but it definitely is worth to have.